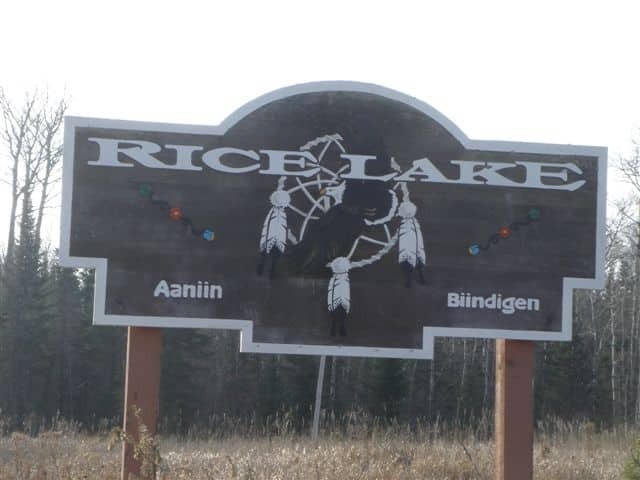 Welcome sign — “Aaniin” (Hi) and “Biindigen” (Come in) — to the White Earth community of Rice Lake, at the entrance to Lower Rice Lake, a popular site for harvesting wild rice. Photo by David Thorstad. In a historic vote, on November 19, 2013, the White Earth Nation in northwestern Minnesota became the first member of the Minnesota Chippewa Tribe (MCT) to adopt a new constitution. Of the 3,492 ballots counted, the vote was 2,780 in favor and 712 opposed, a 79 percent approval. Since the ballots were secret, there is no way to know the demographic breakdown of those who voted. But with a membership of nearly twenty thousand, the rather low participation seems to reflect a certain apathy on the part of many tribal members. Still, the turnout was twice that for most tribal elections. (Anecdotally, of several tribal members I know, only one had read the proposed constitution and none voted.) But the small turnout in no way diminishes the significance of the vote. “Since the White Earth Reservation was established in 1867, this is the most monumental, historic moment in our history, White Earth Tribal Chairperson Erma Vizenor told the Forum News Service (Paula Quam, “White Earth Members Approve New Constitution,” November 20). The goal of the constitutional reform was “the creation of a constitution for the White Earth Nation that would enact Anishinaabe values and envision a perpetual future as well as create an effective governance structure, including separation of powers,” according to Constitution Reform Project Manager Terry Janis and Jill Doerfler (Anishinaabeg Today, May 1, 2013). Funding of nearly $400,000 for the process came from the Bush Foundation, with the aim of supporting Indian nations’ sovereignty. This is a major change. Since the Indian Reorganization Act of 1934, MCT members have operated under constitutions that lacked separation of powers, an independent judicial system (judges were beholden to tribal councils), and dozens of references to having to ask the secretary of the interior for permission to do something. White Earth is the largest Ojibwe band in Minnesota and the biggest member of the MCT. The MCT was created by the Bureau of Indian Affairs as a vehicle for more easily controlling Minnesota Indian tribes. Red Lake, the only Ojibwe band to reject allotment in the late nineteenth century (all land there is owned communally by the tribe), and one of only two or so in the entire country to do so, refused to be part of the MCT. Today, only about 8 percent (around 63,000 acres) of the land at White Earth is actually owned by the tribe. Much of it is owned by the state, the county, or private individuals who are not Native. Indian tribes were not subject to provisions or protections of the U.S. Constitution because they were considered separate nations. Of the five hundred or so U.S. Indian tribes, half have a constitution, and half of those are engaged in a reform process. The most contentious and far-reaching issue in the new White Earth constitution was changing the requirement for membership. Till now, blood quantum had been the basis for membership, but that has now been replaced by lineal (or family) descent. One-quarter blood quantum had been the minimum required under a provision imposed on Indian tribes by the U.S. government. But over time, as qualified membership diminished through marriage outside the tribe or with spouses who did not meet the one-quarter standard, that requirement seemed to guarantee eventual liquidation of Indian tribes (another route to the termination policy the U.S. government once pursued). It is estimated that, if blood quantum was not discarded, by 2080 nobody with one-quarter blood quantum would be left in the tribe and the White Earth nation would cease to exist. Traditionally, the Ojibwe never had a blood measure for membership, and even adopted non-Indians into their tribe if they adopted the Indian lifestyle and culture. So, reverting to family lineage as the basis for membership will guarantee the continued existence of the tribe. Anyone whose parents or grandparents were tribal members will now also be able to petition for membership, regardless of how much “Indian blood” they might have. “Long after I am gone,” said Erma Vizenor, a major force behind the constitutional reform, “50, 80 years and beyond, history will be kind to the reformers and me for having the vision and courage to ensure the perpetuity and democratic governance of the White Earth Nation” (Anishinaabeg Today, November 6, 2013). Not everyone agreed. Some elders opposed the measure out of fear that it would spread financial resources too thin and dilute tribal culture by incorporating people who are not familiar with the Ojibwe way of life. Bluntly put, they feared that white people would end up taking over. The new enrollment criteria could double or even triple the membership. As it is, barely a dozen tribal members are fluent in the Ojibwe language, Anishinaabemowin, and most of them are over age fifty. On the other hand, some families where one parent is enrolled but the other is not because of not meeting the blood quantum level have been denied full participation in the tribe even if they are raising their children in Ojibwe cultural traditions, such as drumming, going to powwows, harvesting wild rice, snaring rabbits, hunting, fishing, and so on. They also wouldn’t qualify for educational scholarships or summer education programs. It is not clear how adoption of the new constitution will affect White Earth’s membership in the Minnesota Chippewa Tribe. It’s a relationship that will have to be negotiated. That is only one of the unknowns the tribe now faces. Others involve how to implement applications for membership under the new criterion and the legislative and executive functions the constitution provides for. The MCT is the only such umbrella group in the United States. This latest reform process began in 2007, after earlier attempts going back to the 1980s. Four constitutional conventions were held between 2007 and 2009, culminating on April 9, 2009, with ratification of the new constitution by delegates (two from each community). Of the forty delegates, the final vote was 18 yes, 6 no. Gerald Vizenor drafted the constitution. 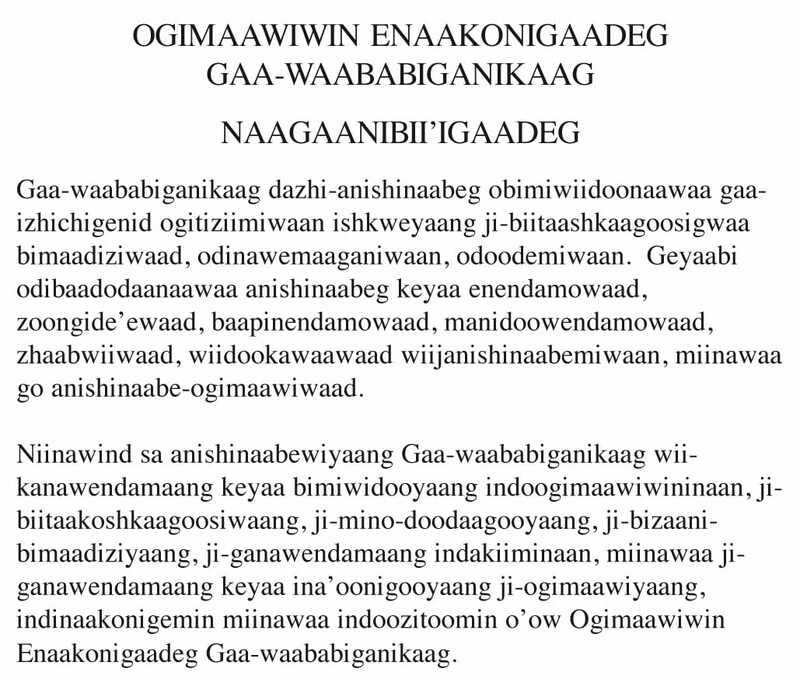 The preamble was translated into Ojibwe by Anton Treuer. White Earth went through a constitutional crisis in the 1990s that gave new impetus to efforts at reform. In 1996, longtime tribal chairman Darrell “Chip” Wadena was convicted, along with two others, for rigging casino construction bids for the casino in Mahnomen, money laundering, and theft of $500,000. He served nearly three years in federal prison, after twenty years as tribal chairman. He retains support on the reservation, although he is barred from running for office again. Most of Erma Vizenor’s support has come from voters living off the reservation. Vizenor was secretary-treasurer during part of Wadena’s tenure, and she became the lead witness against him as well as the dynamo behind the constitutional reform. Repercussions from that crisis continue to reverberate, and in some measure the new constitution is an attempt to resolve the earlier undemocratic concentration of power in the leader’s hands. The new constitution sets a limit of two four-year terms for tribal chair, so Vizenor will not be able to run for that office again, though she plans to run for a position in the new setup. “Of course I have to run, otherwise I would be a lame duck,” she told the Forum News Service. David Thorstad is a student of Ojibwe language and culture. His writings are available at www.williamapercy.com/wiki/index.php?title=David_Thorstad. He can be reached at binesi@gvtel.com.